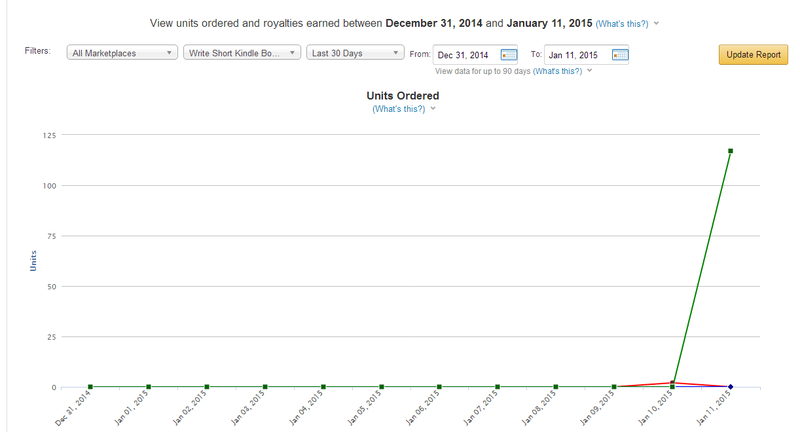 Grab “Write Short Kindle Books” For FREE on Kindle – And A Peek Behind the Book Launch Curtain! Today I’m super excited to announce the launch of my new book, Write Short Kindle Books: A Self-Publishing Manifesto for Non-Fiction Authors, which is available on Kindle FOR FREE for a very limited time starting RIGHT NOW! This book kicks off a new series for indie authors — whether you’re a newer writer looking to explore self-publishing for the first time or an established indie author looking to up your game with a different approach to self-publishing. The book is FREE for a very limited time, so please take advantage! Go ahead and grab a copy at this special launch “price” now while you can! If you dig it, I’d love it if you’d please leave a short review/rating on Amazon, which takes about 30 seconds! To make it even easier, here’s a DIRECT LINK to the review form for the book! Well, for starters, I like experimenting with each book launch. This is my fifth self-published book, and out of all my books, this is the first one that isn’t super niche. It seemed the right book — particularly given its viva revolution / manifesto vibe — to try something very different with. So what do I get out of launching for free? Exposure? Readers? Reviews? An Amazon ranking push? The answer is all of the above. The more FREE downloads I can get today and over the next few days, the better that’ll set the book up for a successful launch when the price eventually switches over to paid. If I can rank in the top 100, which shouldn’t be hard to do if the momentum keeps up, then switching to paid will drop the book in the much more visible top rankings in Amazon’s paid charts. Which in turn, should provide a nice boost in paid sales and help me recoup my expenses. It’s an experiment, of course, but one that’s going well so far and one that I’ve been eager to test. This is the first book I’ve felt comfortable testing it with, in-part because it has a much bigger potential audience than some of my other works, and it’s the first book in a new series. Sort of a win-win, right? It also just feels good to have the book out there and people reading it. So far, customer reviews have been SUPER POSITIVE, which is exciting and humbling for sure. When you’re writing something like a book, you never REALLY know how useful folks will find it, or whether they’ll even enjoy it. To have such positive feedback out the starting gates is really encouraging and makes me a little less nervous about branching off into this new territory with my writing guide books. I really appreciate all of the social media signal boosting that folks have done and want to say thanks in advance for those who keep it up over the coming days. I’ll def need your help to make this a truly successful launch, but we’re on the right track! Tomorrow, I’ll be rolling out some cool video content I’ve created to support the book launch, and if you’re at all familiar with my podcast, The Freelance Game, then I think you’ll dig it. Speaking of which! Even though the show is currenty in a brief “between-season break,” I recorded a special solo Bonus episode last night that talks a lot about the book and how self-publishing can be applied to video game and tech journalism! You can listen to that episode right here! So thanks again and please check out the book while it’s FREE! Also, stay tuned, as there’s a lot more great stuff on the way!